Cambridge’s Crusader Collection of pavingstones with Armortec is defined by shapes that are specifically designed for particular structural landscape and pavement applications, and hardscape solutions, like steps, edging and curbs, pool coping (“finishing” an area around the pool), veneering and permeable pavements. 4 x 12 Bullnose 2-3/8 thick in salmon and other colors. 6 x 12 Bullnose 2-3/8 thick in onyx/chestnut and others. Ledgestone Cast Stones A, B, C, D in a variety of sizes and colors. Holland without spacer bars and chamfered edges in ruby/onyx, etc. 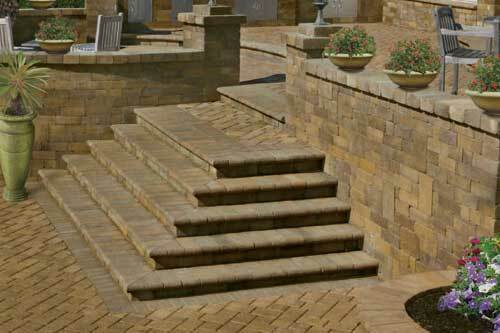 This paver is used for a finished look when the sides of pavers show on steps, risers, landings, knee walls, facing, etc. The Holland paver is also used when a project requires stacking pavingstones. 4 x 8 Holland ADA Paver in ruby. All four pieces are conveniently packaged on one pallet. One cube contains 7 corner units that can be used as a right or left corner, and as regular units. Straight, curved, circular and serpentine designs can be easily created with these four larger configurations – three trapezoidal and one square. Made of cast stone with deep, bluestone-like clefts derived from actual bluestone molds, this multi-use option can be used for pool coping, steps, wall caps and pavingstone borders.